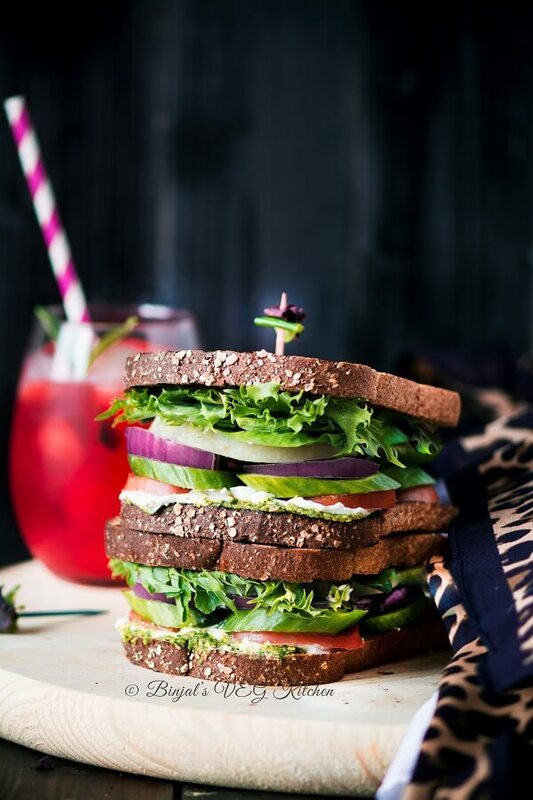 Mediterranean Veggie Sandwich, if you like Panera style Mediterranean sandwich, then I’m sure you’ll gonna love this Mediterranean Veggie Sandwich, fully loaded with veggies and mint flavored hummus, just yum! Yum! I love this kinds of instant food, but healthy no fuss no more work and full satisfaction. I made this my version with homemade hummus and chopped veggies, now I’m absolutely in love! Craving a fast and healthy lunch? This simple sandwich packs a lot of flavor and nutrition, which makes it ideal for an easy weekday meal. 1. In a blender or a food processor, add cilantro, mint, jalapeno, garlic and blend well, scrap it if stick inside. 2. Now add chickpeas, salt, tahini, olive oil and blend it again. Add little water (2-3 tbsp) and make smooth but granny textured mixture. 3. Remove it in bowl or jar. Add lemon juice, mix it well and keep aside. 1. Add herbed garlic salt in cream cheese, mix it well and keep aside. 2. Take bread slices, apply little melted butter on both sides and toast it or grill it or you can roast both sides on griddle till golden brown. 3. Now apply or spread the hummus on one slice and cream cheese on another slice, repeat same process for remaining slices. 4. Then place the cucumber, onion, potato and tomato slices over the hummus slices as per your choice. 5. Sprinkle pinch of salt and black pepper powder over it, then put some spring greens or baby spinach over the veggie slices. 6. Now place cream cheese slice over it (cream cheese applied surface over the veggie). Repeat it for other slices. 7. Mediterranean Veggie Sandwich is ready; you can serve it with ketchup or mustard sauce. You can even pack it for tiffin or breakfast. • You can add peppadew peppers and feta cheese in this sandwich for Panera style Mediterranean Veggie Sandwich. • You can add chopped cabbage, latus, or grated carrot if you like. In a blender or a food processor, add cilantro, mint, jalapeno, garlic and blend well, scrap it if stick inside. Now add chickpeas, salt, tahini, olive oil and blend it again. Add little water (2-3 tbsp) and make smooth but granny textured mixture. Remove it in bowl or jar. Add lemon juice, mix it well and keep aside. Add herbed garlic salt in cream cheese, mix it well and keep aside. Take bread slices, apply little melted butter on both sides and toast it or grill it or you can roast both sides on griddle till golden brown. Now apply or spread the hummus on one slice and cream cheese on another slice, repeat same process for remaining slices. Then place the cucumber, onion, potato and tomato slices over the hummus slices as per your choice. Sprinkle pinch of salt and black pepper powder over it, then put some spring greens or baby spinach over the veggie slices. Now place cream cheese slice over it (cream cheese applied surface over the veggie). Repeat it for other slices. Mediterranean Veggie Sandwich is ready; you can serve it with ketchup or mustard sauce. You can even pack it for tiffin or breakfast. thanks Dolphia, this is a big compliment!